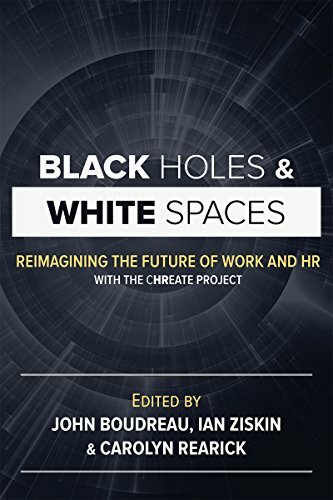 “Black Holes and White Spaces” describes tools and frameworks that leaders inside and outside the HR profession can use to transform the HR profession and their organizational success. It summarizes the collective wisdom and hard work of over 70 exemplary chief HR officers and other leaders. Their mission: Disruptively accelerate the progress of the HR profession to meet the unprecedented challenges and opportunities of the new world of work. “Black Holes” are things that have been talked about for years in HR, but remain stubbornly unresolved. “White Spaces” are things that get far too little attention from HR, but that must be addressed to have a pivotal impact on the future workplace and the success of HR and organizations.These leaders committed to a three-year collective effort dubbed CHREATE -- The Global Consortium to Reimagine HR, Employment Alternatives, Talent, and the Enterprise. They recruited their colleagues and led volunteer teams that tackled the tough challenges, demonstrated how to address them, and built open-source tools and frameworks for leaders like you to use in your own organization. The project was guided by these common beliefs: open source, voluntary, inclusive, messy, and agile. CHREATE focused on four key pillars of change, that organize this book: 1. Align HR with Value Creation for Organizations that Win; 2. Shape Expectations of HR's Key Constituents; 3. Rewire the Work and Tools of HR; and 4. Enhance the HR Talent Pipeline.In this eBook, you'll find 26 essays from a wide range of CHREATE Project volunteers, people who have contributed their expertise, time, and passion to raising the bar for the HR profession. The essays not only describe the frameworks and tools to disruptively accelerate HR's progress, they often provide links to prototypes, guides and tools. Please join the movement! Use this book as your platform to disruptively accelerate HR and work in your organization.